I enjoy thinking about food, especially planning food for an intimate dinner or a casual Sunday brunch. I lose myself in daydreaming about what I’ll make and how I’ll prepare each dish, from the prep work to the rotation schedule for when each dish goes into the oven next. So, with so much energy spent on planning, it’s a shock to learn that a dish you’ve daydreamed about so strongly (and felt was a creative mix of flavors) turns out to be an existing, published recipe. I spent days thinking through this fruit salad which I planned to coat with a ginger syrup and bits of mint. Before starting it though, I did a quick Google search to see if anyone had made anything quite like it. To my disappointment, an exact recipe already existed. Damn you, Epicurious! 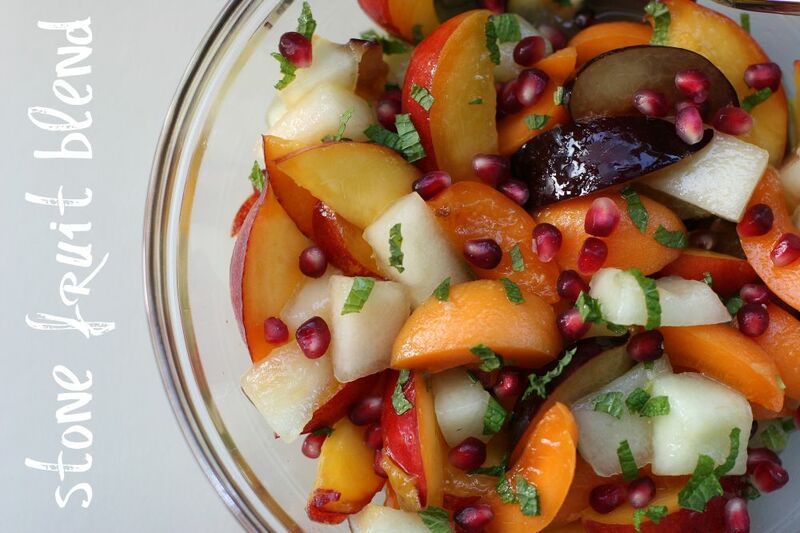 The fruit salad can use any mix of seasonal fruits you desire. As I wandered through the store, I decided that a salad made with a variation of yellow fleshed fruits dotted with pomegranate seeds would look delicious. Yes, I based my fruit selection entirely on color – it sounds crazy to me now, but it did turn out wonderful. I used apricots, nectarines, plums, and melon. The fruit salad recipe is fairly quick to prepare. I made it the night before, slicing my fruits into a bowl and coating with the ginger syrup. The following day, I added the chopped mint and sprinkled with pomegranate seeds before serving. I feared the mint might discolor if added the night before. It is an impressive fruit salad (just as I planned it), and if anything I can take comfort in not having to think too hard about concocting a ginger syrup. Epicurious did the work for me. The result is a lightly spiced ginger flavor which permeates the fruit. It’s not overpowering but adds a subtle ‘something extra’. The mix of fruits worked well too and is a nice change up from the more common watermelon, muskmelon, and grapes I grew up with on the farm. Try this recipe at your next gathering and see if it turns a few heads. I think it will. We ate the entire bowl in one sitting. Aside from the fruit salad, our brunch turned out wonderfully. The meal featured my favorite dutch baby pancakes served with a selection of strawberry syrup, golden syrup, wedges of lemon, and confectioners sugar (I liked it best topped with confectioners sugar, a squirt of fresh lemon juice, and a drizzle of golden syrup). I also made a caprese salad, pork meatballs with tzatziki dipping sauce, strawberry muffins and a spinach-mushroom quiche. You’ll see more of the recipes in the coming week or two. I loved this colorful bouquet our friends brought us – it made the perfect addition to our sunny Sunday morning brunch. In the background, you’ll see my computer workspace where I’m now sitting as I type up this post. Yummy! I love all things ginger and stone fruit. Sounds like a big winner. And those flowers are lovely. I like your thought process Allen. Basing your fruit salad on colour is a good idea as well. I love the simplicity of this…and I’m sure the ginger syrup gave it that extra something! Fantastic! I love to toss fresh herbs into my fruit salads. Have you ever tried it with rosemary? Do it, its great! I always use mint (sometimes more then one) and sometimes add tarragon or lemon verbena or basil. I love my summer herb garden! I can’t wait to try your ginger syrup. Ima whip up a big batch and use it for a bunch of stuff….can you hear the gears turning in my head??? Your brunch sounds amazing! But what I’m really in love with is that flower arrangement. Absolutely beautiful!! Allen, I just love your presentation of this salad. I usually get weary fruit salads as often there seems to be no thought of the combination of fruits as they relate to flavour, colours or textures but yours is a shining example of an exceptional fruit salad. Wow, I love the flavor and color combinations in this salad. Gorgeous! Found you on Leftover Queen, will definitely be stumbling lots of posts. Great blog! Your salad looks beautiful and delicious. I love the stone fruits of summer, my favorite season. And I love ginger. I just bought some South Carolina peaches and was thinking along the lines of using candied ginger with them. Your idea of ginger syrup really excites me, so many things can be done with it. . .
What I’m wondering is how you seem to have pomegranates all year round? Love fruit salads, healthy and sweet :) Never tasted a salad with a ginger touch, interesting to try. Allen hope you’ll have wonderful holidays and have a lot of fun in Europe!! !